Susan Clark, Transitional Shelters, 2014, 101.6 x 76.2 cm. Image courtesy of the artist. 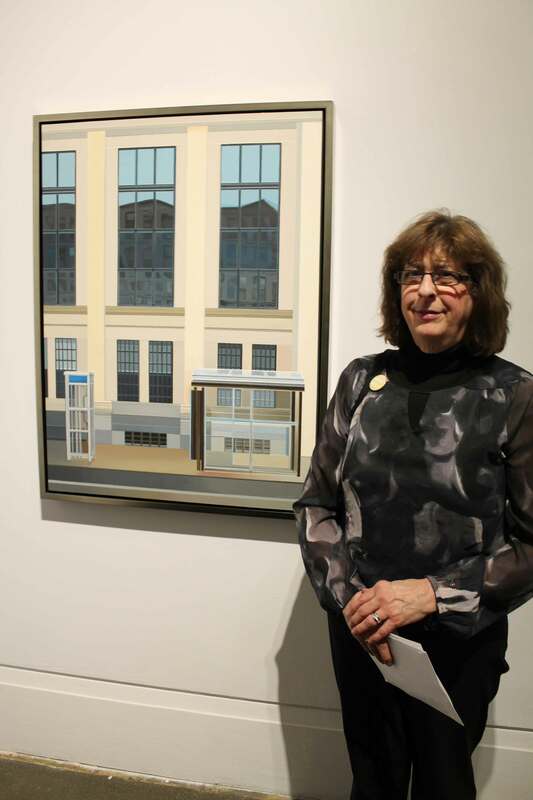 Visual Arts Mississauga 37th Annual Juried Show of Fine Arts, at the Art Gallery of Mississauga from January 15 – February 14, received 232 entries from across Ontario. Jurors selected 41 artists to be in the show. Until the end of the exhibition, the AGM blog will feature VAM 37 artists. Learn about the thinking behind the works in the exhibit, and see the works in person at the AGM! Vote for the VAM 37 People’s Choice Winner at our facebook page! To purchase works, contact the AGM. In this post, the AGM blog features Susan Clark, winner of VAM37’s first place prize. How did you come to the idea to construct this work? What was the thought process behind it and what were your strategies in expressing this idea visually? I discovered this building in Hamilton while photographing architectural images for future reference material for paintings. The grand scale and the colours of the building appealed to me. I was immediately drawn to the building’s clean lines, columns and large leaded windows that reflected the blue sky and the distortion of the buildings across the street. These are the elements that I like to explore along the contrasts between modern architecture and historic or period styles. I work with a limited pallet of colours and this image lent itself to many variations within the colour scheme and repetitive lines and shapes. I loved the contrast between old and new. Once I began working on the sketches, I eliminated some ornate details on the columns that I was first drawn to. I wanted to create a graphic simplicity, a more balanced composition, although I chose to offset the frontal view. When looking at the reference photographs, I realized the structures were in the forefront which was not part of my original creative layout. However these elements seemed to accentuate the temporary modern structures alongside the historic building. The glass structures appeared to be floating in front of the solid building, just placed on the sidewalk. This is a suggestion of time, styles, and contrasts, not to mention a disappearing icon, the telephone booth. Based on your experience in the 905, what has been the importance of a public art gallery and juried art shows? I think juried shows are important for all levels of creativity and it is fundamental to be exhibited alongside each other in a public space. They highlight the countless ways of considering creative images, styles and approaches to the thought process. The artist’s experiences are displayed in many new and traditional mediums, displaying contemporary thought processes and current art practices. Exhibiting your work puts it in the forefront, out of the studio and socializes both artists and viewers. This is visual variation that engages, stimulates and educates all of us. Who’s your favourite artist (ideally within the 905)? How do you feel this artist has inspired your work? Although I enjoy many artist’s works & the mediums they choose to work with from the 905 area, I cannot say that anyone has influenced me. As an art student, I instantly responded to the work of Christopher Pratt and Lauren Harris. The lines, blends of colours, simplified subject content and composition of both these Canadian artists have influenced me. Artist Susan Clark in front of her piece, Transitional Shelters. Photo by Mississauga Life.